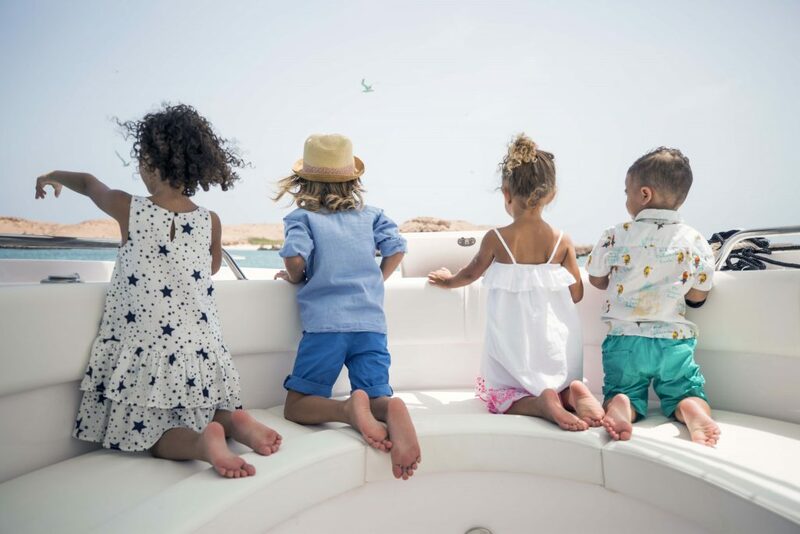 Set sail from Al Mouj Marina to the world-renowned Daymaniyat Islands, where shallow coral reefs teem with over 1100 different species at each of the area’s 24 dive sites. Offering a wealth of sea life that’s unparalleled in the region, you’ll spot Leatherback sea turtles paddling just beneath the surface, and may even be lucky enough to observe the magnificent whale shark. SeaOman’s two powerboats ‘Jade’ and ‘Ruby’ will transport you to the Daymaniyat Islands in just under 40 minutes. 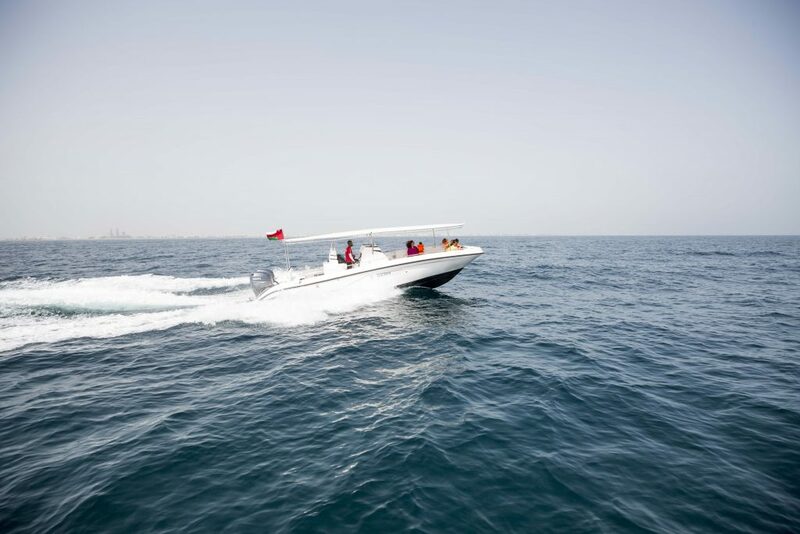 Lying 17 kilometres off the Batinah coast, they are the nine, tiny, uninhabited jewels in the crown for diving in the Gulf of Oman. On our arrival, we will anchor at one of the main islands or in a secluded bay. 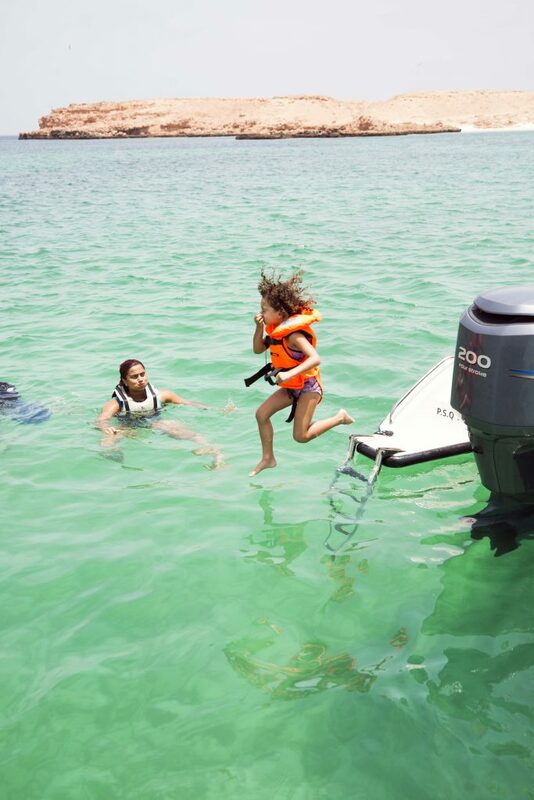 SeaOman will provide snorkelling equipment for you to discover the area’s underwater paradise. 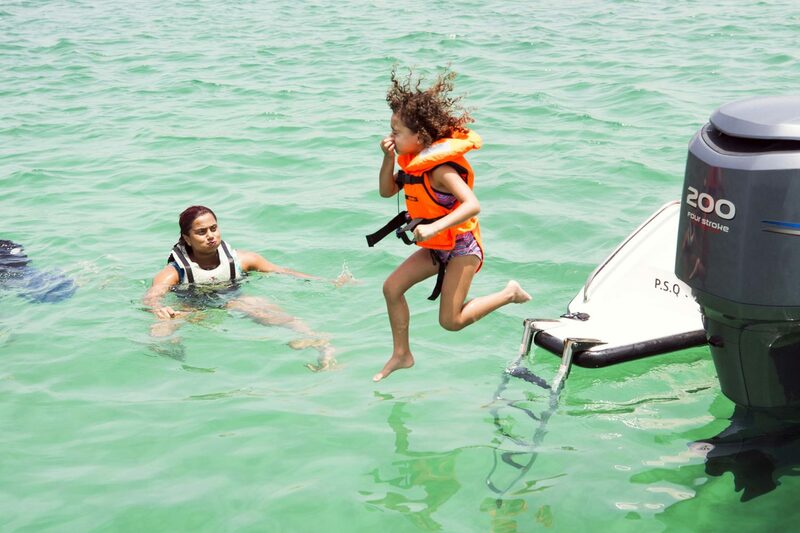 With a vast variety of sea life and coral close to the surface, it’s a particularly rewarding experience. Prolific numbers of colourful reef fish, stingrays, turtles, leopard and whale sharks give you the opportunity to spot an incredible array of marine life. Above sea level, stand up paddleboards will also be available for you to explore the islands at your leisure. With travel times reduced by the modern 32-footer, a powerboat day trip departing from Al Mouj Marina also gives you the choice to head south for the day, to encounter the hundreds of dolphins which bask in the warm turquoise waters of Bandar Al Khayran and Al Bustan. 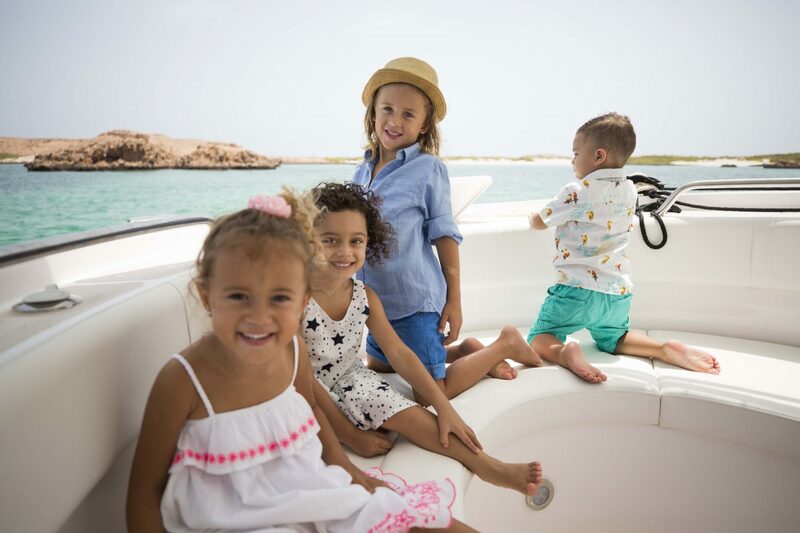 Our powerboats accommodate 10 guests. 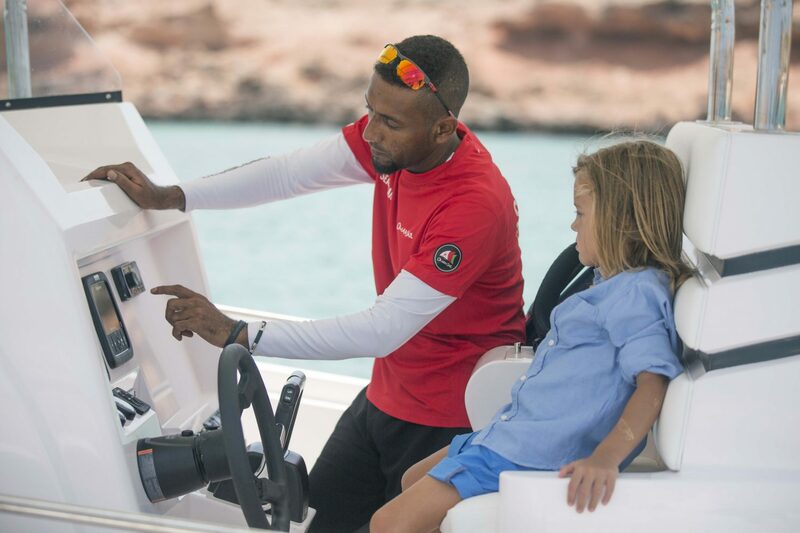 Step aboard the fast and powerful Sapphire 32’, the perfect boat for making quick visits to the pristine marine reserves, hidden coves, deserted beaches and islands for which Oman’s coastline is so famous. Shaded area for relaxing after snorkelling and swimming.